On Saturday the Man and I celebrated our 5th wedding anniversary with a trip to Turners restaurant in Harborne, a lovely suburb of Birmingham just up the road from our free babysitting service (Grandparents!). Turners is located on Harborne High Street, which like most High Streets now is getting a bit shabbier than in days gone by, so it is quite surprising to find a michelin star restaurant sandwiched between a charity shop and a hairdressers. It is a very small restaurant with about 10 tables but nicely laid out with smart decor. 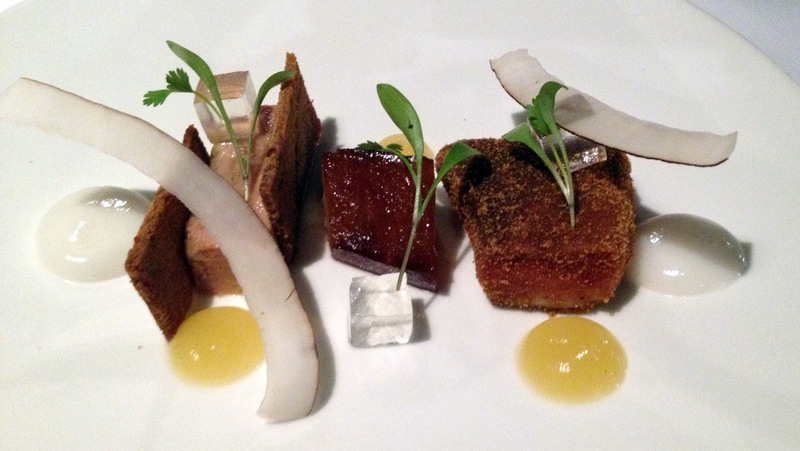 On a Saturday night the only menu option is a £75 8 course tasting menu, so arrive hungry. We started with a glass of bubbles which was Perrier Jouet and served in their lovely Belle Epoque glasses and were presented with a selection of homemade crisps (crunchy but melty deliciousness), pork crackers (a posh pork scratching), gruyere cheese bites (light, fluffy and moist), five spice roasted almonds (very moreish) and olives. This was followed by some fantastic homemade breads with a seaweed butter. My favourite bread was the “bacon roll”, a white roll with little bits of bacon in the middle. Our amuse bouche was a Jerusalem artichoke espuma (a foamy soup) with wild rice. I have to give the upmost credit to anyone who can make a jerusalem artichoke taste so good. It was topped with wild rice which had been cooked, freeze dried and toasted giving it the consistency of a crunchy sugar puff, with the espuma melting on your tongue, the crunch of the rice was a fantastic texture addition. 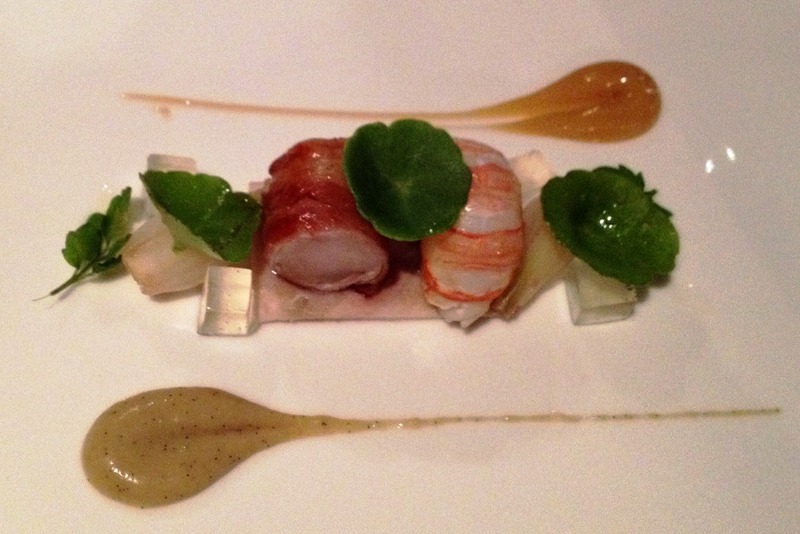 My runner up course was the duo of rabbit with langoustine, vanilla jelly and shallot puree with pennyworth leaves. At the bottom was a confit of rabbit leg topped with a pancetta wrapped loin of rabbit and a langoustine. The confit leg was soft and succulent while the loin was more meaty. 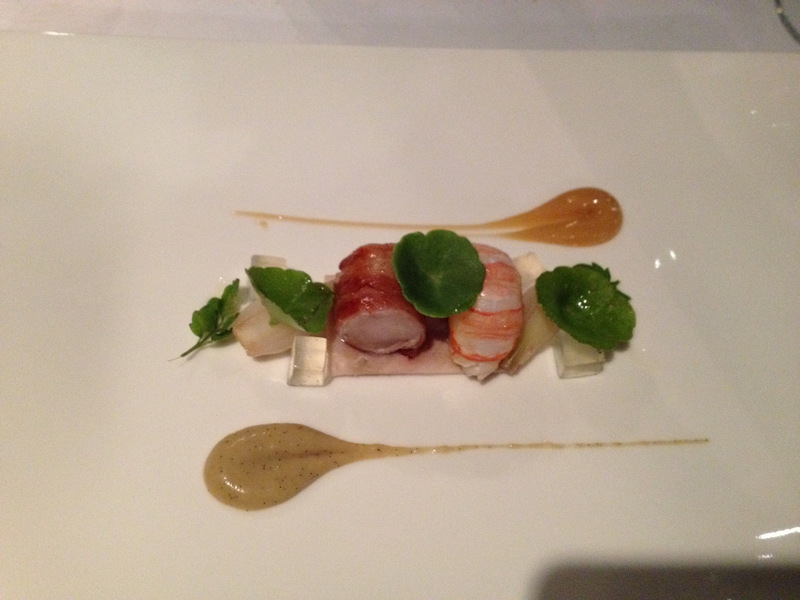 The langoustine paired well with it but my favourite flavour combination was the vanilla and shallot purees. They were both melt in the mouth purees which blended well with the rabbit. My favourite course, which I can also say is my favourite dish I have ever had, was duo of duck liver (foie gras terrine and cooked foie gras coated in gingerbread crumbs). It was served with pineapple compote, coconut compote, a sweet and sour pineapple cube, vanilla jelly cubes and toasted coconut. The flavour combinations were my idea of food heaven. The cooked foie gras coated in a gingerbread crumb was my favourite of the two as the ginger gave it a slightly spicy taste which was softened when eaten with a bit of the compotes and toasted coconut. The sweet and sour pineapple cube on its own almost made my eyes water as it was so sour but a tiny bit of it bought each mouthful to life with a vibrant hit of tang. Words cannot do this dish justice and I am salivating at the memory of it. I am a desert worshipper and when the final desert of a raspberry souffle with chocolate sorbet was presented I almost fainted with happiness (it could also have been due to overindulgence). I was so full already but I would not let that stand in my way. It was light, fruity and sweet. The chocolate sorbet was nice but a bit too much for me so I ate most of the souffle on its own which was still delicious. The service was good, two of our waiters were very friendly and seemed happy to engage in conversation when we initiated it, although there was one waiter who wasn’t so comfortable engaging and seemed quite stressed at times. The sommelier was nice giving some good wine suggestions although we let him choose and didn’t look at the menu so I was quite surprised when each glass cost £12.50. I had asked in advance to have a paper copy of our menu printed with the date as we have had this from previous restaurants and its nice to look back on them so I was a bit disappointed they forgot this request. Overall I thought the food was fantastic, with only the pork dish falling short of expectations, I don’t like pork much anyway and as course number six of eight I found it too heavy to really enjoy. The service was good although not as personal as some other restaurants we have been to. Turners has been called one of the best value michelin stars in the country and whilst they seem to do some good value menus during the week, I thought the final bill of £249 (2 tasting menus, 6 glasses of champagne/wine and service) was on par with most other michelin star restaurants. Would I go back? Yes, but probably to try one of their midweek or lunchtime menus and probably not before we try Purnells. Would I recommend it? Yes, the food was fantastic and we had a lovely evening. We too REALLY want to try Purnells, but this sounds fantastic. The duck foie gras terrine and langoustine dishes in particular sound to die for.